Where do Measure 66 and Measure 67 really stand? Arguably, the first important political event in Oregon in 2010 will be the January 26 election result. So, what do the survey numbers I posted earlier imply about how the election will turn out? This post is going to look at what two different social science models of voter decision making imply about where the election is. It’s well recognized that surveys are only snapshots in time. However, polling from previous elections can give us some idea where the campaigns for measures 66 and 67 will be heading. The idea is to look at what information the voters have when they answer the questions. To examine two possible patterns, I’ll look at public polling on two recent Oregon statewide money measure elections. The first model describes the polling for November 2007’s Measure 50, a proposed tobacco tax. Tracking surveys are at: http://lindholmcompanyblog.com/?p=1590. The upper graph has the actual survey numbers and the lower graph shows the voters after assignment. The first survey showed the “yes” side well ahead. Subsequent surveys were very good predictors once the undecided voters were allocated to “yes” or “no” in proportion to the already decided “yes” and “no” voters, respectively. Using this model would result in an exactly correct forecast: Yes: 40% and No 60%. Note that this model also implicitly assumes that the undecided voters are, on average, have attitudes just like already decided voters. A second model describes the polling for January 2003’s Measure 28, a proposed temporary income tax increase. The public survey, conducted by the University of Oregon’s Survey Research Laboratory, as published in the Register Guard newspaper (Jan. 20, 2003) reported Measure 28 ahead by 46% to 35% with a margin of error of plus or minus 5%. In this case, the undecided voters all should be allocated to the “no” side. Using this model would result in an exactly correct forecast: Yes: 46% and No 54%. Note that this model implicitly assumes that undecided voters are fundamentally different from decided voters. Undecided voters are “no” voters. Most ballot measures fit one of these two models. The question is: Which model is more like measures 66 and 67? If it’s the model of November 2007’s Measure 50, then Measure 66 effectively leads 53% yes to 47% no and Measure 67 effectively leads 58% yes to 42% no. Both measures would be winning! If it’s the model of January 2003’s Measure 28, then Measure 66 effectively trails 40% yes to 60% no and Measure 67 effectively trails 46% yes to 54% no. Both measures would be losing! Subsequent research should provide a clearer picture of which model was correct. Category: Oregon, Political | Comments Off on Where do Measure 66 and Measure 67 really stand? Ethnic Latinos are a relatively recent immigrant population.Compared to the California average the registration rates among the young are much higher. This is probably a combination of a relatively higher civic involvement among the young and relatively higher birth rates than the average population. As is true with many immigrant groups, the young are relatively more integrated with American civic culture than the old. A comparison with the full age pyramid, including both voters and non voters,would provide a bit more precision to this view. There is no sharp “Obama” spike, however, among ethnic Korean voters. This is unlike what is seen both among Californians as a whole and among many other ethnic groups. The vote propensity is the number of elections voted in, zero through four, out of the past four primaries and generals (June and November of 2006 and June and November of 2008). The graph has five lines, one each representing the percentage of total registered voters by each year of age for each of the five vote propensity levels. Voter ethnicity was identified based on surname and personal name. This is considered the best available method, though it is likely to miss some members of the ethnic group and include some who are not members. Source of raw data: Labels and Lists of Bellevue, Washington. 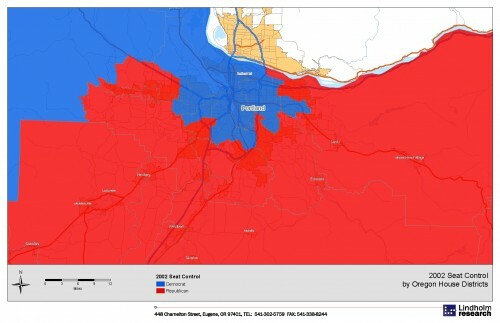 This post presents the situation in the Portland Metro after the 2002 November General in greater detail than the earlier statewide post could. Republicans generally represented the suburbs and Democrats represented Portland and the coast. In the few cases where Democratic districts extended into the suburbs, a sizable portion of the population was in Portland, such as House District 33, a sizable portion of the population was in a core Democratic area (in this case northwest Portland). After decades of steady Republican registration gains, the 2002 election voters were the most Republican electorate in Oregon since official records on partisan turnout began being kept in 1964: http://lindholmcompanyblog.com/?p=11; and probably the best since 1954. 2002 saw an even more Republican Oregon electorate than during the 1994 Republican national landslide. 2002 saw the high point of Republican victories during this decade. Since 2002 there has been a steady decline in the number of Republican districts. In general, the partisan geography of Oregon’s house districts follow the national trends where urban areas are the most Democratic, rural areas are the most Republican, and suburban areas are in the middle. The Democrats were in control of the 2001 redistricting process and many felt that fact alone would lead to big Democratic gains. The strong Republican registration and turnout more than counterbalanced the Democratic advantage in district boundaries. Source of data: Oregon Secretary of State. 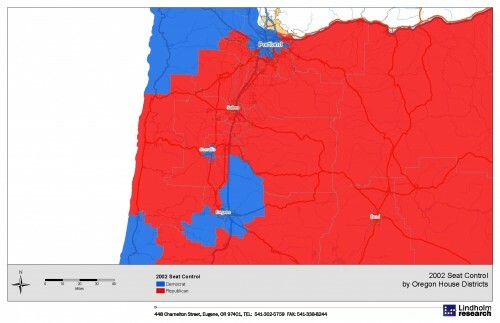 This post concentrates on districts in the Willamette Valley after the 2002 General Election. Republicans represented all the areas outside the coast, the university towns of Corvallis and Eugene, and region neighboring Portland. Essentially, only the traditionally Democratic coast, universities, and Portland stayed out of Republican hands. Where Democratically-held districts extended into rural areas, such as House District 11, a sizable portion of the population was in a core Democratic area (in this case near the University of Oregon). The spike among the youngest voters is the “Obama” spike. Younger voters registering just to participate in the 2008 General Election. This post is the first in a series that looks back at the state house seats after the 2002 Oregon General Election. In many ways, 2002 was a high water mark for Oregon Republicans. 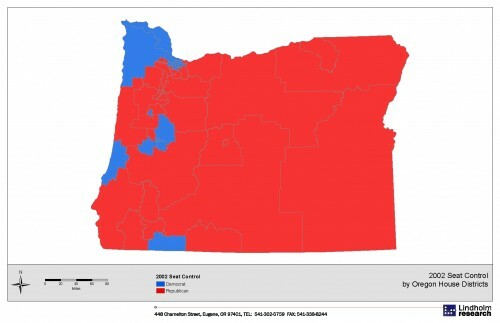 The map clearly shows the Republican districts in the moderate suburbs and semi-rural areas of Oregon. As Republican hopes for 2010 increase, this map presents an estimate of the optimum Republican result if they use the same kind of approach they did in 2002. Measures 66 and 67 are probably better seen as a package deal. The legislature passed them as two parts of the same plan and opponents circulated petitions against both of them together. 1.Republicans and Other Registrants who oppose the tax by nearly two to one (Yes 20% to No 40%). 2.Democrats without college education, who slightly oppose the tax (Yes 26% to No 16%). This demographic segment reminds one of the Clinton Democrats in the 2008 Primary. 3.Democrat with at least some college, who strongly support the tax (Yes 59% to No 10%). This demographic segment reminds one of the Obama Democrats in the 2008 Primary. The key point is that the percentage of potential swing voters among the “Clinton Democrats” is exceedingly high. They were one of the key swing groups that switched sides and helped vote down the 2007 Tobacco Tax. http://lindholmcompanyblog.com/?p=1597. Only time will tell if they switch sides and provide decisive votes again. If the election were held today, would you vote yes or no on Measure 66: Raises tax on household income at and above $250,000 (and $125,000 for individual filers). Reduces income taxes on unemployment benefits in 2009. Provides funds currently budgeted for education, health care, public safety, other services. IF YES/NO: Is that strongly or somewhat? IF DON’T KNOW: Which way do you lean? If the election were held today, would you vote yes or no on Measure 67: Raises $10 Corporate Minimum Tax, Business Minimum Tax, Corporate Profits Tax. Provides funds currently budgeted for education, health care, public safety, other services. 400 live telephone interviews of likely January Oregon Special election voters were conducted November 30 through December 2, 2009. The margin of error at the sample median is 5 percent (with 95 percent confidence). CHAID (Chi-squared Automatic Interaction Detection) was used to construct the graphic. This survey was conducted as part of a long-term project studying Oregon politics and not for any political committee. As of the time this survey was conducted, Lindholm Research was not working for either the Yes or No sides. Ethnic Filipinos are a relatively recent immigrant population.Compared to the California average the registration rates among the young are much higher. This is probably a combination of a relatively higher civic involvement among the young and relatively higher birth rates than the average population. As is true with many immigrant groups, the young are relatively more integrated with American civic culture than the old. A comparison with the full age pyramid, including both voters and non voters,would provide a bit more precision to this view. This post analyzes these measures as a package deal. This graphic adds a “Combined” pseudo-question to help with the analysis. A “Yes” vote means yes on both measures. Hence, it is a measure of baseline “Yes.” A “No” vote means no on both measures. Hence, it is a measure of baseline “No.” The “Swing” percentage includes those who are yes and/or no on only one measure or undecided on both. The “Swing” percentage soars to 40%. This amplifies the conclusion that there is no solid coalition built for either yes or no on taxes. 1.Republican men, who strongly oppose the tax (Yes 15% to No 71%). 2.Republican women, who slightly oppose the tax (Yes 34% to No 36%). 3.Other Registrants, who slightly support the tax (Yes 41% to No 36%). 4.Rural Democrats (Congressional Districts 2 and 4), who solidly support the tax (Yes 49% to No 26%). 5.Metro Democrats (Congressional Districts 1, 3, and 5) who strongly support the tax (Yes 74% to No 11%). The undecided exceeds 20% in three of the five segments, only getting as low at 15% among the most strongly disposed segments (Republican men and Metro Democrats).